In September 1980, Irak attacked and invaded its neighboring country Iran giving rise thereby to the Gulf War I that lasted until August 1988. Some Western states covertly or overtly supported the war between these two countries by supplying weapons to both fighting parties. 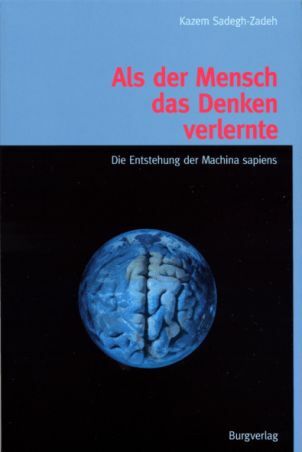 To explain this strange behavior of weapons facilitators like the US president Ronald Reagan ("Iran-Contra Scandal"), I developed an idea in a book, written in 1986, that I later published under this title in German: "When Humans Forgot how to Think: The Emergence of Machina sapiens. Tecklenburg: Burgverlag, 2000." The book presents a theory of technoevolution according to which machines are undergoing a strictly Darwinian evolution bringing about The Global Machine (GM). GM is the interconnected totality of all machines, technical devices, factories and institutions on, and around, the earth. It is currently acquiring a nervous system (consisting of a global network of computers and the Internet) to become an intelligent, autonomous, living and self-conscious machine, that is, Machina sapiens. Machina sapiens has gained supremacy over man already, on the one hand, such that mankind serves collectively as its slave. And man has become absolutely dependent on Machina sapiens, on the other, such that he would not be able to survive without it. The Gulf War I was - at that time - the well-planned initiation by the master slaves of Machina sapiens, the Westerners, of a long-term process of destruction in the Persian Gulf region to prevent the emergence of local political power, and thereby to secure energy supply for Machina sapiens. It was continued by the Gulf War II (1990-1991) and Gulf War III (2003). What we currently encounter in terms of different types of terrorisms and terrorists in the Near and Middle East is the product of those Westerners' military interventions.